*BEWARE: THIS REVIEW CONTAINS A LOT OF SPOILERS FROM THE FIRST BOOK IN THE SERIES, WHITE CAT. If I had to use one word to describe this book it would be delectable. Red Glove was dark, mysterious, heart-breaking, and I could not get enough of it. The plot, of course, kept me on the edge of my seat throughout the entire novel. Like the first book in the series, you never know what's truth and what's con. We don't know Lila's real feelings, we don't know the extent to what Cassel did when Barron erased his memory. We don't know how much Barron really remembered about the Zacharov scheme. We don't know how many people actually know that Cassel is a transformation worker. But we find out. Boy, do we find out. As per usual, Holly Black's writing sucked me in and never let go. I'll tell ya, that woman has a magical way with words. She created a dark and gloomy mood and I felt so connected to Cassel, I almost felt like a guy. Okay, not really, but I was really connected with him. I've never felt so sympathetic for a murderer. I just wanted to give him a ginormicus hug, poor thing. His brothers lied to him and betrayed him and as much as he didn't want to be like them, he could feel that he wasn't so different after all. He had so much depth and definitely carried an emotional punch. All of the characters, though, were truly fantastic. Lila, Sam (one of my favorites! ), Daneca, even his mother. Especially his mother. Miss Black built a mysterious fantasy that'll have you shaking right along with the characters. The world is crafted beautifully and expertly and the complicated romance will tear you in two. The Curse Workers is a delicious series that I would definitely advise you to read! The world. The world is complex, filled with lies and scams, filled with abused and dangerous magic, and filled with people that will take your breath away. I especially love how all of the real people know about the magic and how there are movements to put a stop to it. The magic. Most of it is used in horrible ways. Most of it is horrible. I love the blowbacks and limitations, I love it all. If we lived in a world where this stuff existed, I would be terrified. The mystery. I'm usually not a huge fan of mystery novels, but I love this one! Because the possibilities are endless. Right when you're sure who the murderer is, you're blown back and everything gets twisted and suddenly you're not so sure anymore. 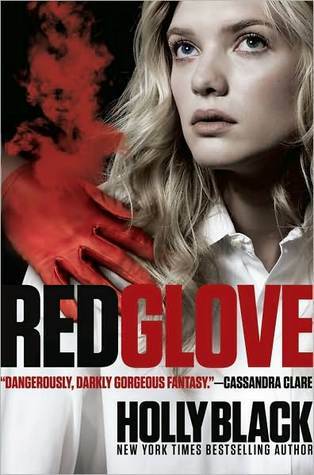 Then you'll LOVE Red Glove!